Edinburgh’s Old Town stretches along a ridge to the east of the Castle, and tumbles down Victoria Street to the broad expanse of the Grassmarket. It’s a jagged and jumbled maze of masonry riddled with close’s (alleys) and winds (narrow lanes), stairs and vaults, and cleft along its spine by the cobbled ravine of the Royal Mile. 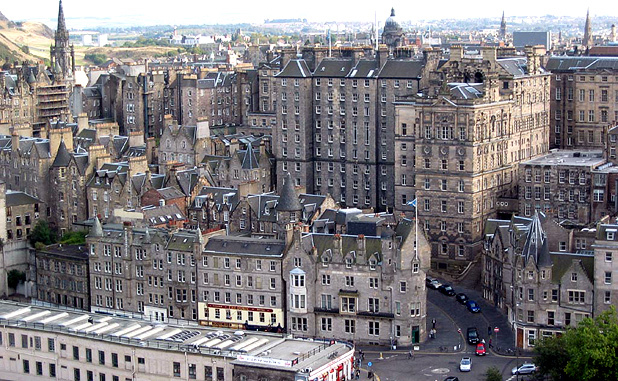 Until the founding of New Town in the 18th century, old Edinburgh was an overcrowded and insanitary hive of humanity squeezed between the boggy ground of the Nor’loch (North Loch, now drained and occupied by Princes Street Gardens) to the North and the city walls to the South and East. The only way for the town to expand was upwards, and the five-and six-storey tenements that were raised along the Royal Mile in the 16th and 17th centuries where the sky scrapers of their days, remarked upon with wonder by visiting writers such as Daniel Defoe. All classes of society, from beggars to magistrates lived cheek by jowl in the urban ants’ nests, the wealthy occupying the middle floors – high enough to be above the noise and stink of the streets, but not so high that climbing the stairs would be too tiring – while the poor squeezed into attics, basements, cellars and vaults amid the rats, rubbish and raw sewage. The renovated Old Town tenements still support a thriving city-centre community, and today the street level is crammed with cafes, restaurants, bars, and souvenir shops. Few visitors wander beyond the Royal Mile but it is worth taking time to explore the countless closes that lead off the streets into quiet courtyards, often with unexpected views of sea, city and hills. Edinburgh’s Old Town is a must see attraction on your tours of Scotland.